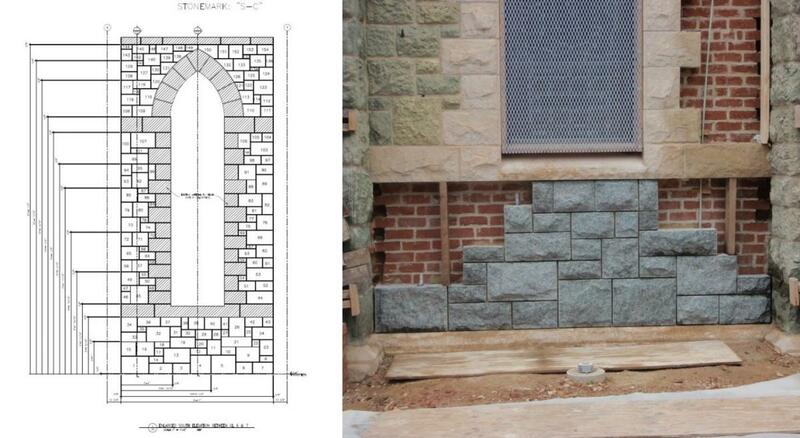 Constructed in 1895 and designed in the English Gothic style, the original exterior mass masonry walls of the St. Francis of Assisi Catholic Church in Staunton, Virginia, consisted of green serpentine stone laid in a random ashlar pattern and were backed by three wythes of brick masonry. In the late 19th century, the green serpentine stone was prized for its distinctive green color. However, around the same time, it was becoming increasingly evident that the stone did not lend itself as a suitable building material because it is “soft,” as far as a rock is considered, and susceptible to deterioration. While the green serpentine stone was used for the majority of the building’s north, south, and west elevations, there were several other stone types found on the building. Native Shenandoah Valley limestone was used as the foundation stones, and Indiana Limestone was used to make the window surrounds, elaborate entryway, and rose window surrounds as well as water table and trim courses around the building. The church had been experiencing interior water infiltration, significant cracking and spalling of existing serpentine stone, and cracking and staining of limestone elements. Copper elements had been damaged or were missing, and the original bell tower corner spires had been damaged due to storms in previous years causing at least one to fall from the tower and the remaining spires to be removed. There was documentation of various masonry repairs implemented over the last few decades, including the repointing of the stone masonry and replacement of greenstone at the bell tower. However, over recent years, the remaining greenstone continued to deteriorate. Metal catch baskets had been installed above the north elevation entrance to protect parishioners from falling rock and debris prior to the commencement of the façade repairs. WDP also performed hygrothermal analyses to permit selection of materials to minimize any change in moisture vapor movement through the wall system to protect the integrity of the original horse hair plaster used in the interior wall finish. Overall, the project entailed a comprehensive overhaul of the entire exterior wall system, which included removal of the existing greenstone and rubble masonry, repointing the remaining brick, and installation of a new brick wythe and grouted collar joint behind new four-inch-thick granite stone. WDP developed an exterior shoring system and demolition / reconstruction phasing plan which allowed the main sanctuary and the other facilities on the grounds to remain completely operational throughout the execution of the façade replacement. Digital Scanning - Church elevations were digitally scanned to develop shop drawings to identically match new stone dimensions to the existing. Each stone was numbered and uniquely identified. GFRP Reinforcing Bars - Due to the reduction of stone thickness between the original serpentine and the replacement granite, GFRP bars were incorporated into the walls at locations of high tensile stress. The GFRP was chosen over conventional reinforcing steel due to its high tensile capacity, better strain compatibility, small diameter, and longevity due to its insusceptibility to corrosion. Exterior Bracing System - External supports, consisting of steel columns anchored through the exterior stone masonry, allowed the exterior walls to retain enough stability to resist out of plane loads and support the roof structure, even while over half of the overall wall thickness was removed. Extensive construction scaffolding and overhead protection were designed and installed. The scaffolding featured cantilevered sections to access all elevations of the bell tower without loading the existing copper roof. The restoration was substantially completed in May 2016, and the design and repairs were conducted in accordance with the requirements for obtaining Virginia’s Department of Historic Resources Rehabilitation Tax Credits. This project won the 2016 MIA+BSI: The Natural Stone Institute Pinnacle Award of Merit in Renovation/Restoration. It was also awarded the Heritage Preservation Award from the Historic Staunton Foundation in January 2018.